Last month we released our long awaited teaser trailer, and with long awaited I of course mean that it was planned about 2 weeks before releasing it. I hope everyone loved it as much as we did. We also did our annual year in review post along with the September progress update, detailing this time everything that happened since we started. We made a short post on reddit (where the whole project started), thanking the community for supporting us. The subreddit mods where not the biggest fans of it, so if you don't see us mentioned on there anymore it doesn't necessarily mean that the project died, just that we are not allowed to post about it. With the trailer release we also gained a whooping 22 new members on the discord, so welcome to everyone we hope you stick around for the journey. Now giving it over to myself, for this months progress report. When working on a large game, the time comes at some point where one should consider freezing the current version of all the software and frameworks that your project depends upon. This ensures that API's or other functionality doesn't break when updating. This is not one of those times. Unity's ECS or Entity Component System has been in the works for quite a while and allows for some pretty big performance optimizations for large scale games, which Project Arkadia is. Currently we have only worked with the old MonoBehaviour system, which has been the standard in Unity for as long as I can remember. But ECS is really different and works in some magical ways that means that everything would have to be rewritten, relearned and pretty much put me back to zero on what I know about game programming. Fortunenattely the guys over at Unity Technologies have made whats called the Hybrid system (or something like that) allowing for both the use of ECS and the old MonoBehaviour, meaning that we could rather easily move our old logic to the new system. The reason we haven't done this earlier was because the SpatialOS SDK (our networking solution) didn't support Hybrid ECS or ECS at all, that all changed early this month when SpatialOS released their new GDK (Game Development Kit) that is build to fully support the extend of both pure and hybrid ECS. I'm not going to go into to much detail about ECS, but currently nearly all systems has been ported and are mostly working on the new system, some stuff has been scratched, but the benefit of the new system in the long run will more than make up for that. The character controller has gone trough its fair share of reworks, and it has now once again. I've always worked on the assumption that the game was to be played in 3rd person, which was clearly a mistake. In a poll on discord people clearly voted for the game to be played in first person, if they were given only the choice between 1st and 3rd person gameplay. As nothing is ever easy people of course wanted to be able to switch between playing from first or third person perspective. As this is a community project and the community has spoken the new character controller will have support for playing in both first and third person and the option to instantly switch between the 2 while playing. In any game given the option to cheat, somebody absolutely will. For most games the solution is obvious, give the server absolute control. This is an option, send the input to the server calculate the movement and physics on the server and send the new location back, 30 or maybe 60 times every second. This adds huge costs both in needed bandwidth and processing power needed on the server. One of the most important optimization areas when developing this game will be keeping server cost down, getting the game into as many people's hands without overcharging them is important to us. Currently the anti-cheating system in place for movement lets the player have authority over itself, but the server remembers your last position a long with your last direction of movement and calculates whether or not the information you send could have been possible, if not it will snap you right back to where the last time the server saved a legitimate position change. The character creator got some love this month as well. You are now able to actually equip clothing items and have them animate with your character. There is still quite a few kinks to figure out, like the skin clipping trough clothing and some items are not aligning probably. Once that is figured out, along with saving and spawning the new custom character into the game world, we can start grinding away on making wearable items. Our translation team now consists of 6 people (this does include both me and Darwin), and the game is currently planned to be translated into 7 different languages, including; Russian, German, Danish, Swedish, Spanish, Hungarian and French. If you wan't to help translate the game into another language than the ones listed, come join on us discord. Quite a few art assets was made this months, both concept art as well as in-game ready models. 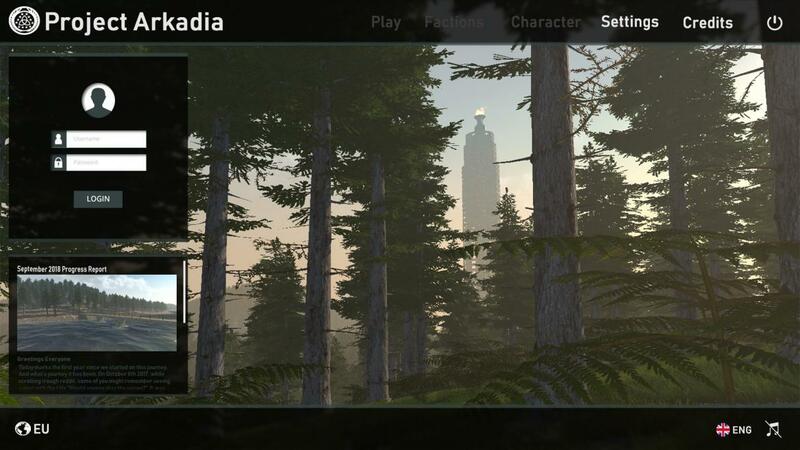 Yet another main menu concept, and probably one of the most sleek looking so far. Its made by our very own Jenó over on discord (May his power-supply rest in piece). It includes an easy way to login, read the latest news, access important settings as well as an option to change your language in-case you accidentally set it to one you can't understand. 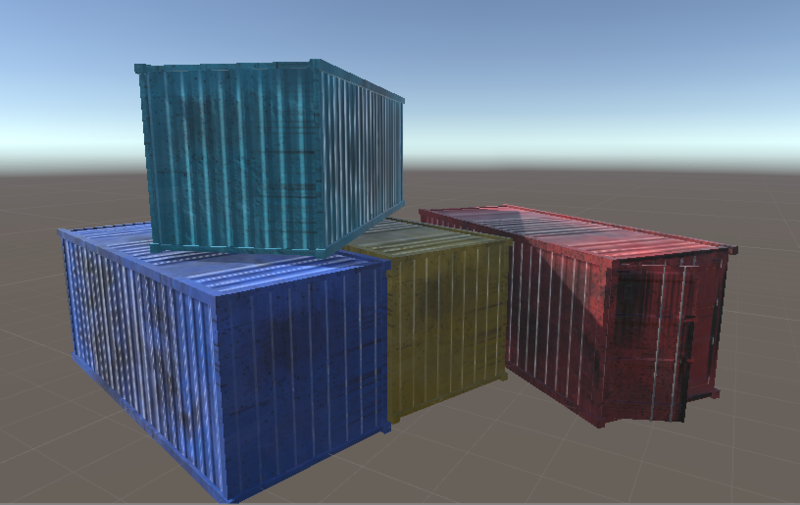 Shipping Containers? Are we already making floatkru along with their huge platform? No, unfortunately we are not that far in development yet. The shipping container made by one of our new discord members 'Blommed'. Is one of many modular items that will be used to build grounder villages. Grounders builds their houses out of what ever they can get their hands on. This includes wood, scrap metal or whole shipping containers. The fantastic looking spear you see below, was also made by bloomed. And is one of many weapons to be included in the game. The Dropship is getting a much needed rework. The original model was made quickly to get something in-game and has been untouched for a very long time. Below you can see an early look at the exterior of the new Dropship model. Its made by JoshuaStilinski, another new member on Discord. So far its looks fantastic I can't wait to replace the in-game model with this one.